HCM City (VNA) – Ho Chi Minh City always supports and makes all-out efforts to step up cooperation activities with Gangwon province of the Republic of Korea (RoK), especially in the areas of both sides’ potential like tourism, culture and sports, a municipal official said. 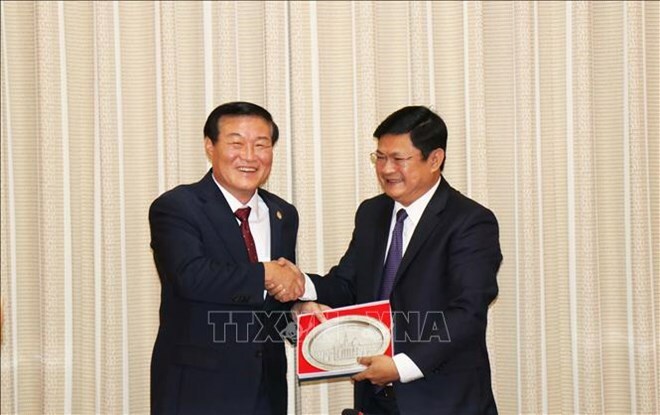 Huynh Cach Mang, Vice Chairman of the People’s Committee of HCM City, made the remarks while receiving a delegation of Gangwon province led by its Vice Governor Chung Man-ho on September 7. He welcomed the Gangwon delegation to HCM City to join the International Travel Expo (ITE-HCMC 2018), saying the trip demonstrates goodwill and determination of Gangwon’s leaders to enhance the friendship and cooperation between the two sides following the signing of the memorandum of understanding (MoU) on the establishment of the friendship signed in June 2017. The official described the recent signing of the MoU on cultural and sport cooperation by the HCM City Department of Culture and Sports and Gangwon province as a step to concretise agreements reached by leaders of the two localities, opening up new opportunities for collaboration in culture, sports and other realms. For his part, Chung Man-ho noted with pleasure the strong development of the relationship between Gangwon and HCM City, and expressed his hope that the bilateral cooperation in culture, sports, tourism, economy and trade will be further tightened in the time ahead through specific projects and programmes. He said the MoU on cultural and sport cooperation will serve as a foundation for the two localities to reinforce their collaboration in this field.